Slimming World Diary: Steak & Mushroom Casserole ..
Tonight I had a gorgeous steak and mushroom casserole, at just 2 syns per serving. This one pot serves 4 and really easy to make. 1. Preheat oven at 180c/Gas 4. 2. Toss the steak in the cornflour to coat evenly then place in the casserole dish. Add the mushrooms, onion, carrot and garlic and toss to mix well. Pour in the passata, wine and stock and season well. 3. Cover with a lid, bring to the boil then transfer the casserole to the oven and cook for about 2 hours or until the meat in tender. 4. Serve immediately with potatoes and veg of choice. 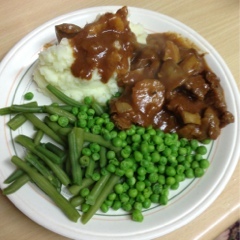 A truly great low syn meal, and you could also substitute the mushrooms for the same amount of kidneys to make a great casserole take on a popular pie.